Brian Stepp has published a cookbook. It is called Childhood Memories Recipes. It is $12.95 + $6 shipping and handling. It has all of the old family recipes like Sylvia's Hash, Red Velvet Cake, Brian's Cheesecake, Whoopie Pies, and Pizza Omelets. 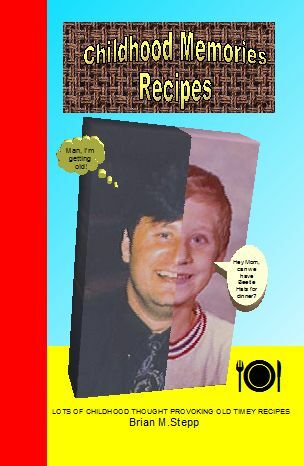 It has lots of family recipes and memories of things that had to do with his family. This book is guaranteed to make you remember fond memories of your childhood. If you want to buy one, click the Buy Now button below to pay online by credit card. This book is also available as an ebook. Buy now and we will send it through email in a zip file that can be opened as a PDF file in Adobe Reader, or we can send it to you as a word file.